Once upon a time, in the Deep, Dark Woods of the North (or the barren plains of the Midwest – whichever fantasy world you want to set the story in), there lived a teacher. Perhaps a somewhat naïve, over-zealous teacher. And that teacher was me. Or I. It was I. It was me. I was it. I was the teacher. Years ago, I undertook an adult embroidery class here in my community. It wasn’t really a formal class – it was a group that would meet once a week to learn. We soldiered on for quite a while, using a room at a local school to meet in and stitch together. We had fun! 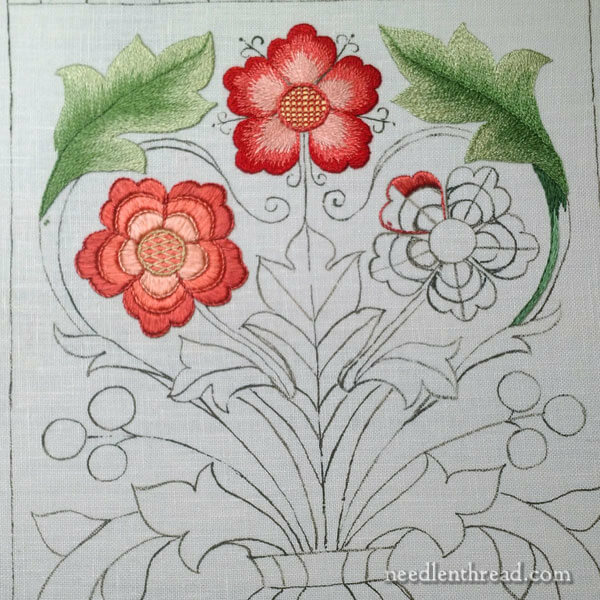 We covered all the basic stitches that are used on relaxing embroidery projects like flour sack towels. And many of the gals completed many flour sack towels. We made a couple embroidered baby quilts that we raffled for a fundraiser. Some gals would bring whatever they were currently working on at home, to get advice or ideas. And we’d break for coffee and cookies. It was fun. Relaxed. Simple. But then I got it into my head that we could kick things up a notch. We could, I enthusiastically sold the idea, embark upon embroidery with silk! And to that end, I proposed this (rather ridiculously complex) silk embroidery sampler. Many of the crew decided to get in on it. I ordered supplies and we set out. I taught them how to set up a frame, how to transfer the (rather ridiculously complex) design onto linen using prick and pounce. I taught them the basics of silk shading with stranded, spun silk (Soie d’Alger). And away we plugged, though the group began to dwindle somewhat. As the group dwindled, so did some of the enthusiasm. 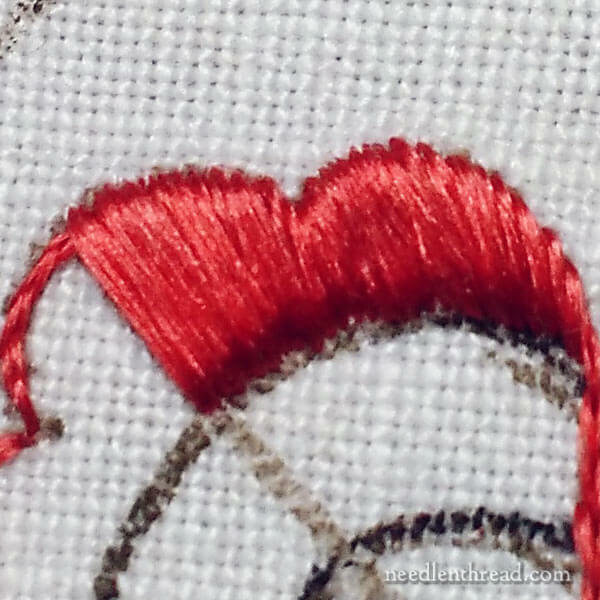 We moved on to flat silk and satin stitch. We surmounted the Frustration Obstacles of working with flat silk, by introducing laying tools. And it began to dawn on me about then: it seemed as if the sampler had become a chore, rather than recreation. It was a weight, a cloud, a looming mountain. We didn’t look forward to Tuesday nights with the same vim and vigor. And we began to meet less often. And when we did meet, we spent a lot of time on the coffee and cookies. And then we lost our room at the local school for our meeting spot. We tried to meet in my workroom at home for a bit. And we had coffee and cookies and chatted, occasionally creeping through block shading with flat silk. And then life intervened for most of the gals, many of whom were moms and had kids and school and stuff to take care of. Others had full time jobs. Others had volunteer work that occupied them. I had two jobs. While we were doing simple things together, we had a great time. Enthusiasm was high. Everything was relaxed. Everything was as it should have been. But then I got over-zealous. I wanted more, and I wasn’t far-sighted enough to see the consequences of leaps too large. It was a community group of beginners. Their vision was not my vision. 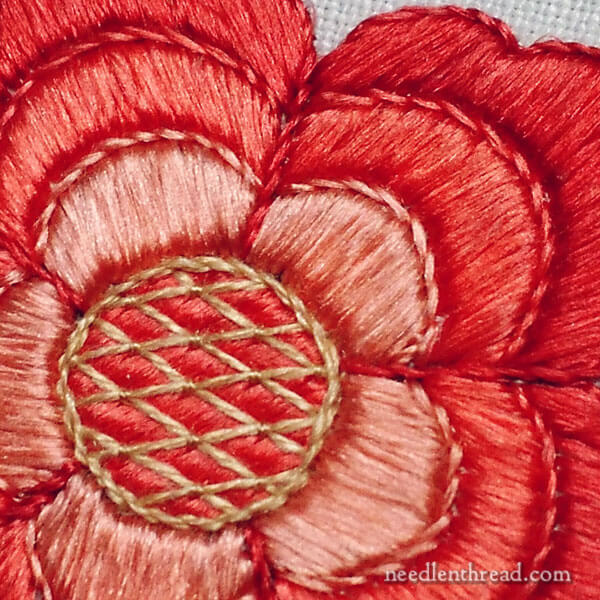 When you want to spread the love of embroidery and get people to pick up a needle and stick with it, the trick is to know what your people want, and to give it to them. Camaraderie, a creative outlet, nothing too taxing to add to an already-taxing life. The motivation to take just a tiny step forward. The thrill of success. Then, you lead by baby steps, not by (rather ridiculously complex) Gargantuan Leaps! It was a mistake I still regret, that silk sampler. While organizing the workroom this summer, I came across it. I think I’ve learned a bit – especially regarding stitchery – since then, but I still have a long, long way to go. The best lesson I learned? Keep it simple. Uncomplicated. Unhurried. Relaxed. 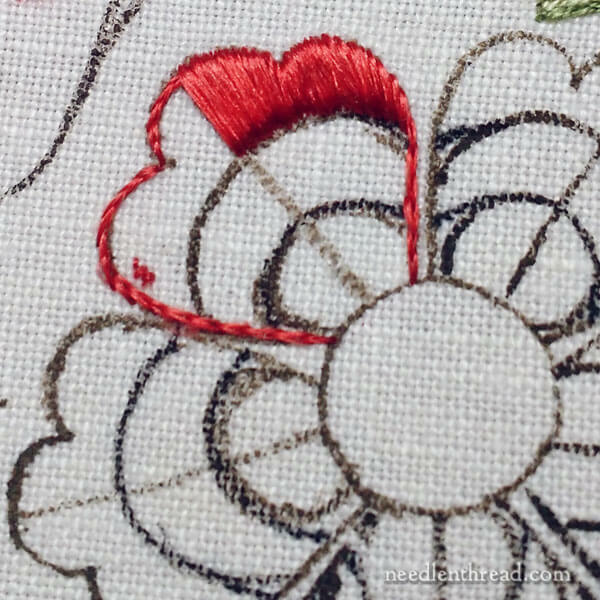 If your embroidery is harassing you, if it has become a cloud over your head or a weight upon your shoulders, step back. Slow down. Relax. Un-complicate it. Otherwise, you just might go the way of my silk sampler… which was a complete fizzer! Your honesty and your advice about keeping it simple is refreshing. I do like the design!. It reminds me a bit of something William Morris-like with the upper leaves. Mary, Thank you for sharing your reflections. Chalk it up to “live and learn”. 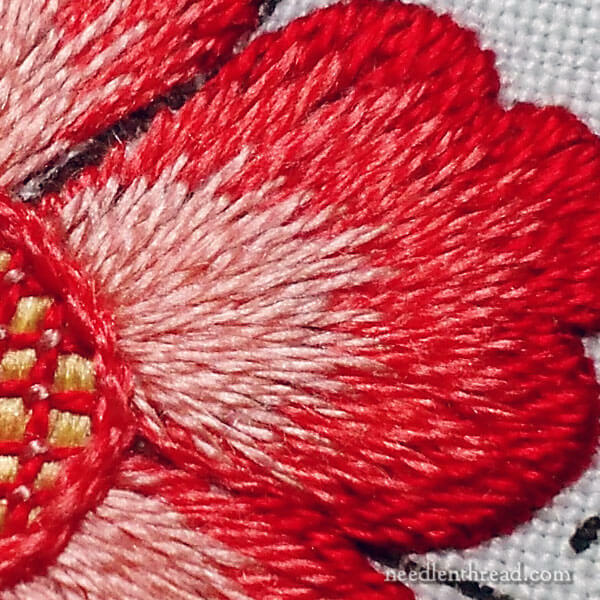 I’m one of those who has wandered down some of the pathways of embroidery, wanting to learn this and that, but it took many years to reach that point. I’m not as far along the way as you are, but I do seem to have wandered farther than most of those around me. And baby steps — as I continue to learn, sometimes I take too big a step; those projects tend to get set aside until “later”. When some of these projects “call” to me again, I realize I can make use of things I’ve learned along the way. As you mention, one of those is that I need some simpler projects to revive my energies (sense of completion) or to work on in more social setting. And yes, sometimes I need reminders, too, that others aren’t on the same journey that I am. Thank you for all the sign-posts you’ve given us. What a great article! I am getting ready to present embroidery to a local quilt group. I keep thinking of how to teach them certain stitches, etc. Keep it Simple Stupid keeps coming to mind!! !Thank you! Loved the post today. This is so true in many aspects of life. Thank you for the excellent illustration of a profound truth. Life happens! 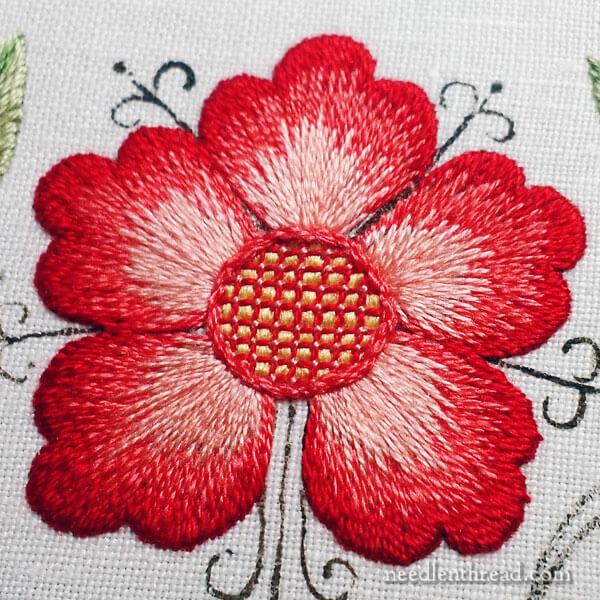 We do what we can and move on, but one thing for sure, your embroidery project is beautiful. There is no doubt about that. Very wise words! And that advice can be used on everything in life. Or as my mother would say, “If you don’t enjoy it, set it down and move on.” I am just beginning the use of silks in my embroidery. I have read everything on your site, several books and am taking an EGA beginners class. Babysteps. And, yes, I am enjoying the journey! What a shame the group finished, I attend a stitching and knitting group at my local Church and most of the women are knitters I’m the only stitcher. We generally create things for the Church such as knitting a huge poppy display Remembrance Sunday it looks lovely. I’m beading a vestment for a one of the Priests. The nice thing is the variety of backgrounds of the women and different women attend every week and yes there is tea/coffee and biscuits. I’ve got to know so much about the area I live in through these diverse women. I think the above design is lovely. Thanks for sharing the lesson learned long ago with us and for your wise words of the art of simplicity. I shall be away Friday going to visit my brother in Dorset tomorrow, so I will see you Monday. I hope you have a great weekend. I would have loved to be in that class, because I would have finished this beautiful project.I love challenges and when it comes to embroidery I am really stubborn.When I finish something beautiful, complicated I feel happy, accomplished, fulfilled.Everything has to be simplified, has to be relaxed, has to be enjoyed, but in the same time you have to feel passion for what are you doing because without that people simply do not accomplish things. I think your problem was the members of the class, my opinion is that they wanted to socialize.There are some classes that can’t be taught somethings because they simply do not want to learn.Everything can be learned one stitch at a time, but it can be done. Couldn’t agree more, Sharon V.
KISS is always a good approach when introducing others to a new topic. I also have to remember that my attitude towards new things is mostly not shared by others. I approach things thinking, “How hard could it be? Other people do it, I want to do it, therefore I will probably be successful.” Others seem to approach things the opposite way, “That looks hard, so it must be hard. I will need detailed step by step instructions, a kit, and I probably still can’t do it and my item will be sad-looking.” I find this frustrating in the classes I take. Especially when people don’t really try. All true lessons, but my lordy that silk shading is GORGEOUS!!!! Those words can apply to so much more and not just embroidery. Thanks for sharing. Frame it up the way it is as a reminder! I have a couple of ‘never going to be finished’ pieces that contain some lessons for me. Keeping them around to remind me keeps me from making *that particular* mistake again. I might have squibbed on the class, too, but if you feel inspired to finish the sampler and document it, I’d happily buy an ebook of it! Awww, what a sad story! I think we all have different motivations and ambitions; some people really just want to do relaxing, easy work, others want instant gratification, some want to try out everything, some want to produce the most perfect and technically impressive work, some want to express themselves. I suspect most people fall into one of the first two camps. Will you finish the sampler? I think the design is beautiful. Just thought i would say thank you for you site, It’s great. 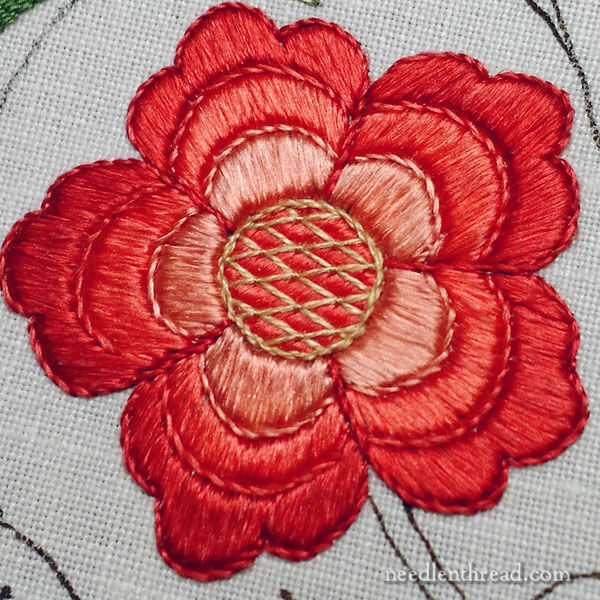 You are very generous with information and advice and I love your needlework I am relatively new to embroidery and your regular email always inspires. I have read many of your post but I have never commented. This one in particular resonated with me. I’m on a current mission to keep my projects simple. I turn 60 this year and I don’t want to leave lots of unfinished projects when the Good Lord calls me home. This article has encouraged me to verbalize my resolution for 2018. KISS and finish my WIP. I simply love the sampler.. I believe it is worth the effort … but I totally agree with the lesson learned. Mary, since I have found you I feel like I have found a treasure.